PRODUCT: Cleasby 2 Piece Trash Chute Hopper with 30 in. Cable Sling. Price/Kit. (shipping leadtime 2-3 days; FreightQuote shipping). 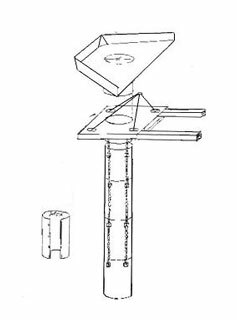 DESCRIPTION: Cleasby Hopper/Funnel Plate #C02350: A 2-piece hopper with top funnel plate and a bottom adaptor plate. 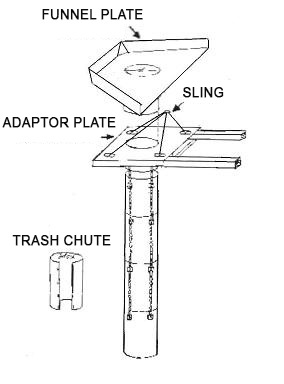 The bottom adaptor plate includes the sling. Adaptor plate is equipped with 2 steel pockets designed to house 4x6" wood counter lever supports (not included. The other end of the wood supports are secured to the roof top. Trash Chute Pieces #C02300: Each is made of heavy duty 30" diameter X 4' length tapered plastic. Hardware is bolted together. Chutes can be set up in minutes. Each tapered section telescopes into any other section and is fitted with support chains. Just hook section chains above, hoist to roof level and secure to outrigger supports. Cleasby Trash Chutes are designed to be used with a one or two piece trash chute hopper.